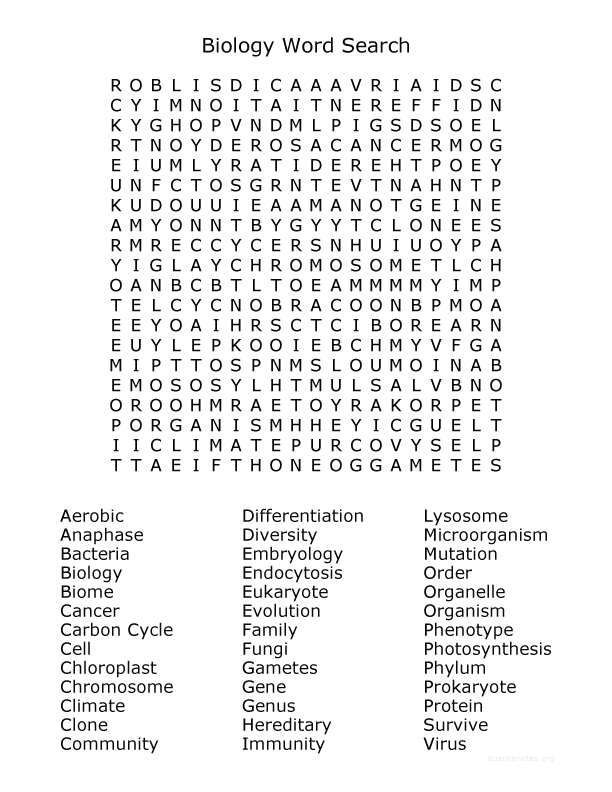 Biology Word Search is a word search puzzle using glossary terms associated with middle school biology courses. These biology topics include words dealing with living systems, genetics, the cell, and the environment. The words can be found running left/right, up/down and diagonally within the array of letters. Word searches can be a fun way to introduce many of the terms a student will encounter in their first class involving the life science of biology. Click the image to view a full-sized version of the puzzle optimized to fit on a single sheet of paper. For better printing quality, downloading the PDF of the biology word search is best alternative. If you have trouble finding a particular term, feel free to take a peek at the completed solved word search (or you could download the PDF of the solution). This is a list of the words appearing in the Biology Word Search and quick definitions of each term. prokaryote – a type of single-celled organism with no defined cell nucleus.